Welcome to Spring! Resurrection, new life, a fresh season! So much to celebrate. 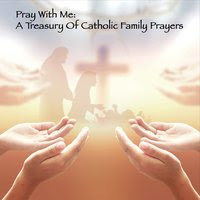 Many children will be making their First Holy Communion, Confirmations, and graduating from one chapter to another. May brings great abundance for the heart and senses. Did you know? Alfonso X of Castile in the 13th century wrote Cantigas de Santa Maria a series of 420 poems and canticles honoring of Mary in the month of May? How beautiful! 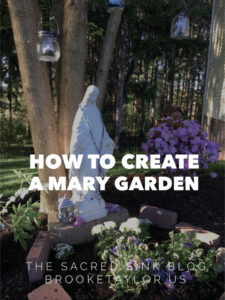 Another long standing tradition is the idea of a Mary Garden. 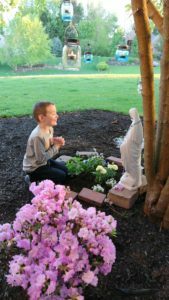 The following excerpt is taken from “Mary: Ever Virgin, Full of Grace” from this article written by Cheryl Dickow for the Catholic News Agency. In the Middle Ages, missionaries and travelers spread stories across Europe about flowers named after Mary and various times of her life. Mary Gardens that featured these flowers became popular there, and later the tradition made its way to America. 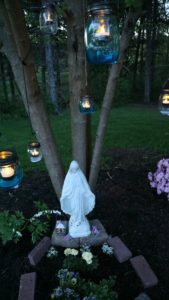 Around 1932 it is believed that the first Mary Garden in the United States was constructed on the grounds of St. Joseph’s Church in the Woods on Cape Cod. 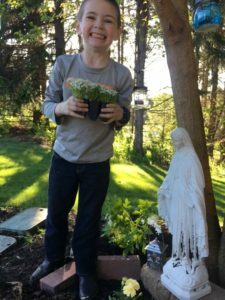 Lily: Legend tells us that the Angel Gabriel held a lily in his hands when he came to tell Mary that she was chosen to be the mother of the Savior. Lilies are often depicted in pictures of Mary as an indication of purity and grace. Rose: The rose symbolizes Mary as the Queen of Heaven. The red rose represents sorrow. The white rose shows joy, and the yellow rose stands for the honor bestowed upon Mary. Columbine: This flower is often called Our Lady’s Slipper. Legend says that this flower sprang from the earth where Mary’s feet stepped when she was on her way to visit Elizabeth. Carnation: Legend says that the carnation bloomed on the night of Jesus’ birth; a sign of Mary’s joy at the Child’s birth. Oxeye Daisy: It is said that when the wise men reached Bethlehem they looked for a further sign to guide them to the new king. King Melchior saw a white and gold flower and knew which building to enter. Star of Bethlehem: The shape of the flower is said to resemble the star that the Magi followed to find the Christ Child. Snowdrop: The snowdrop is said to have bloomed in February when Mary took Jesus to the temple to present him to God. Rosemary: It is believed that Mary hung the linens of the Holy Child on the rosemary bush to dry. Afterwards, the bush carried a sweet aroma. Marigold: Early Christians placed marigolds around statues of Mary in place of coins calling them Mary’s gold. Reading the list, a foggy memory of my Grandmother’s “Mary Garden” began to resurface in my heart. She loved her garden! I decided this is what my heart wanted to do for Mother’s Day. Since our landscaping is still nonexistent after two years in our home (the estimate from a local nursery made us both laugh and weep)! We’ve decided to go ahead and blaze our own landscaping trail, eventually. For now, the front corner of the yard ended up being a perfect spot to begin. 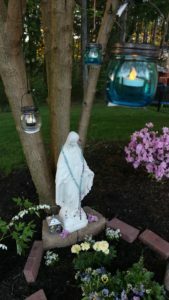 We moved our outdoor “Mama Mary” statue to a nice, protected spot under a mulberry tree. The tree backdrop is good, in that it provides natural, beautiful framing for Our Lady. However I quickly discovered that the challenge is finding flowers on the list that thrive in the shade. We love roses, but rose bushes need lots of light. Same thing with lilies. Lilies-of the-valley were a possibility but they can be invasive. If it isn’t already obvious, I am clueless when it comes to floriculture. Its times like this I wish I could bend grandma’s ear. She was so knowledgeable about this sort of thing. The internet and local growing centers have been a great help. 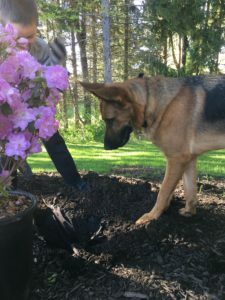 But, what started as simple task of planting a few flowers, has actually been a pretty time consuming endeavor over the last week. Albeit a wonderful one! We are still in the early stages and I expect this to go through some different variations over time, but this is what we have so far! 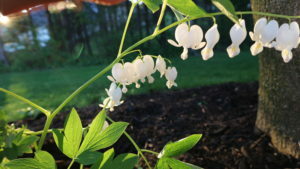 Bleeding Hearts (shade loving plants that enjoy cool weather). Then Simeon blessed them and said to His mother Mary: “Behold, this Child is appointed to cause the rise and fall of many in Israel, and to be a sign that will be spoken against, 35so that the thoughts of many hearts will be revealed —” and a sword will pierce your soul as well. On the bottom of the photo, you can see a hint of the Marigold flower..
Marigold (Vanilla)-“A very versatile flower. They enjoy full sun and hot days and grow well in dry or moist soil. 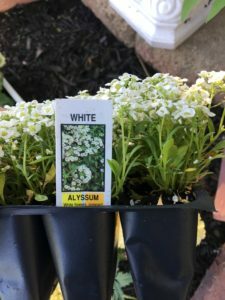 This hardiness is one of the reasons that they are often used as bedding plants and container plants.” *Bonus: they are super affordable! I also grabbed a flat of violas (they look like pansies) to fill in the main bed area. Because our front area is so bare (sorry neighbors)! It will take a while before things are full and complete. It would be nice to show a total before/after pic, but this is still a work-in-progress effort. 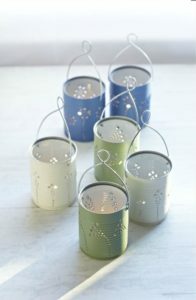 But then I spotted the glass lanterns for about the same price it would’ve cost to make the tin lanterns. AND they came in blue and white. Thank you, shopping angels! I couldn’t find the exact style online, but I bought these at Michael’s for less than $4 a piece! This is a similar style. 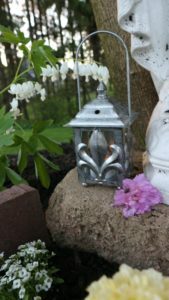 It was also exciting to find this Fluer-de-lis lantern for just a few dollars at Michael’s too! The Blessed Virgin Mary (symbolizing her perpetual virginity/purity and being chosen by the Trinity to be the Mother of God). Virgin Saints and martrys, (best known perhaps, as representing St. Joan of Arc and the country of France). What a beautiful thought. Of all the things he could’ve done to “decorate” her, he only thought of her heart. It was a special lesson for me. It doesn’t matter how plain or “painted” we are on the outside. It matters that others see our heart. Just like the flowers in the garden. They are not to just represent her physical beauty, but her virtue, purity and faith. Thanks for the priceless reminder, Gus.